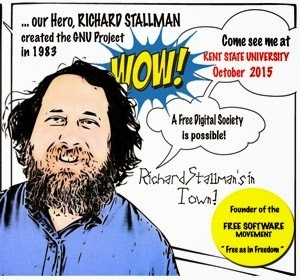 Richard Stallman of the Free Software Foundation (FSF) will be speaking Saturday October 17th 2015 at the Kiva Auditorium of Kent State University, in Northeast Ohio. Stallman is frequently mistaken as a supporter of Open Source software, which he is not: Why Open Source misses the point of Free Software. Stallman has been involved with the computer industry since the last 60's. A must read book for all involved in computers and embedded systems is Hackers - Heroes of the Computer Revolution by Steve Levy. Sponsored by the Northeast Ohio Chapter of the Association for Computing Machinery (ACM).